Do you frequently forget to turn off your home appliances or just want to monitor your Fridge, AC, Cooler, Water pump, Geyser, Heater etc? There is an intuitive solution for this situation by BeConnected which is an innovative Indian company comes up with Betty smart plug + App. You can take some hint my its name about its functioning. In this electrical equipment, you can Remotely monitor & control your home appliances with help of a mobile app which can Auto schedule the Switch on/off your appliance from anywhere. This device need not any kind of WiFi or Internet connection because it works on GSM. 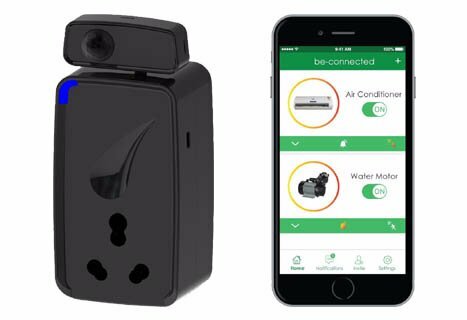 To use the Betty Smart Plug you just need to Download the be-connected mobile app which is available for both the most popular platform from Android or iOS store. And just plug in the wires Betty Smart Plug and connect the Home equipment with Betty Smart Plug and now you can monitor all the connected appliances from anywhere. You can even Monitor the electricity consumption by an individual machine connected to the Betty Smart Plug and also provides information on cost savings as you reduce wasteful consumption so you can efficiently use the electricity and reduce the monthly bill to a great extent. The features of this device not only limited to monitor the electricity consumption but also to improve the overall security because it also has a motion sensor that can be activated and monitored from the Mobile App. So whenever it detects any movement/motion around it, your phone will start getting an alarm and this device will also send a message to your emergency numbers. This device is definitely going to change the way of using Home Appliances. You can control and monitor any Home Appliance by adding them in be-connected app. So you can manage your time and tasks in more better and efficient way. This Betty Smart Plug is currently available in very reasonable price. check the Original Smart Plug + App by Beconnected.